Today, Acromag's product line encompasses a wide variety of I/O devices for manufacturing, military, scientific, public utility, and transportation applications. For Process Instrumentation, Acromag's signal conditioning line features more than 100 transmitters, isolators, alarms, and computation modules. If networked I/O is required, Acromag offers analog and discrete I/O modules for Ethernet, Modbus, and Profibus. 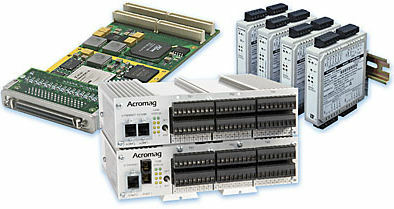 For Real-Time Control Systems, Acromag provides a full line of high-performance analog, digital I/O and serial I/O bus boards for VMEbus, PCI, and CompactPCI® computer systems including IndustryPack® and PMC mezzanine modules. Acromag's years of experience in designing industrial I/O have given us a clear understanding of the problems associated with industrial measurement and control. Solutions to ground loops, RFI/EMI noise, and temperature drift are designed into every product to assure precise operation in hostile environments. Many products are available with agency approvals such as UL, cUL, FM, CSA, CE, ATEX, and others. In addition to the over 3,800 products available for shipment, Acromag has 60 years' experience modifying units and producing custom products. Once a modification is defined, Acromag enters it into our documentation system and it becomes available as a standard product. This means that it can be re-ordered at any time in the future simply by using the assigned model number.